May 2018 saw the installation of the 200th Valmet IQ Fiber Measurement Sensor on Irving Tissue's tissue machine #1 in Saint John, New Brunswick, Canada. For many years, the nuclear basis weight sensor, together with an infrared moisture sensor, were the standard to provide an oven dry basis weight reading for control purposes. Several years ago, Valmet combined fiber weight and moisture in a single non-nuclear sensor, Valmet IQ Fiber Measurement. "The need for nuclear safety training and licenses are now eliminated, as well as the specialized service and safety requirements for radioactive devices. 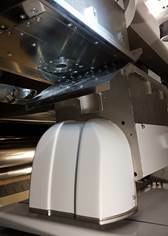 Installed on tissue machines that use virgin pulp, or recycled furnish, the accurate scan averages and high-resolution CD profiles measured by IQ Fiber provide a solid foundation for machine- and cross-direction oven dry weight controls", says Marko Toskala, Director, Quality Management Solutions, Valmet. Developed especially for tissue, IQ Fiber uses multi-wavelength infrared detection to selectively measure fiber, water and other sheet components with high frequency across the sheet. As well as significantly reducing the initial investment cost, IQ Fiber users report lower maintenance and cleaning requirements leading to as much as 75% lower total cost of ownership. The response speed and signal-to-noise-ratio of IQ Fiber are significantly better than the nuclear sensors it replaces. This improves the detection of transient or cyclical variations and adds a significant troubleshooting capability to the system in performing detailed online variability studies and allowing for process improvements. Space for a scanning platform is always limited on tissue machines where open draws, especially with lighter grades, are minimized. The latest generation Valmet IQ Scanner is the ideal scanning platform for IQ Fiber. Its slim dimensions and dust-proofing ensure accurate and stable sheet quality measurements in the hot, humid and dusty environment of the tissue machine. Simultaneously measuring fiber weight and moisture, Valmet IQ Fiber has replaced the traditional nuclear basis weight sensors.